We are particularly fans of Clet’s artwork because of his ability to engage with an already existing design and then go ahead and create something completely new and original from it. Often ‘simple concepts’ that make you think “ah I could have done that” (then why didn’t you?) are the most ingenious; because we really couldn’t have, that’s why they’re the artists. Clet’s street signs also demonstrate the fun that exists in a world that often takes itself far too seriously and they can’t help but make you smile when you come across them. Enjoy! All the world’s a stage, and every October all the players make their entrances on the London art scene. From the galleries who launch their newest exhibitions to auction houses hammering down on their latest prized artworks to numerous weekend long art fairs; in this time the capital becomes the undisputed centre of the art world. The launch night for Reem Gallery’s inaugural London show brought together art admirers, passers-by, collectors and artists into one merry and vibrant evening. Being surrounded by more traditional art dealers, our selection of carefully curated artists has been very well received as a welcome addition to the Mayfair and St. James area. It seems deep down there is a rebel in all of us. Around the corner at Sotheby’s auction house, Banksy’s ‘Girl with Balloon’ sold for just over £1 million pounds and then was instantly shredded infront of aghast onlookers! An historic event for sure that was broadcast globally across news channels. A timely reminder too that despite its infancy, the street art movement is one of the most talked about genres in the world today and will no doubt have a lasting legacy. You can catch Reem Gallery’s ‘REBEL’ exhibition until October 30th at Mason’s Yard, St. James’s in London. Don't miss out on all the fun! Catch the latest art market news, releases and events now. 1940's/50's vocal hamrony group The Candy Girls added a dash of glamour and provided live entertainment at the VIP evening. We debuted on the art fair scene at the inaugural Surrey Contemporary Art Fair at Sandown Park in Esher this past February. The event was an absolutely fantastic experience and we were delighted to meet so many art enthusiasts and collectors, welcoming them to our gallery portfolio as well as entertaining existing clients over the weekend. Many artworks from prints to paintings and neons found lovely new homes and to those reading who have purchased - we hope you have many years of enjoyment from your new artworks and thank you! 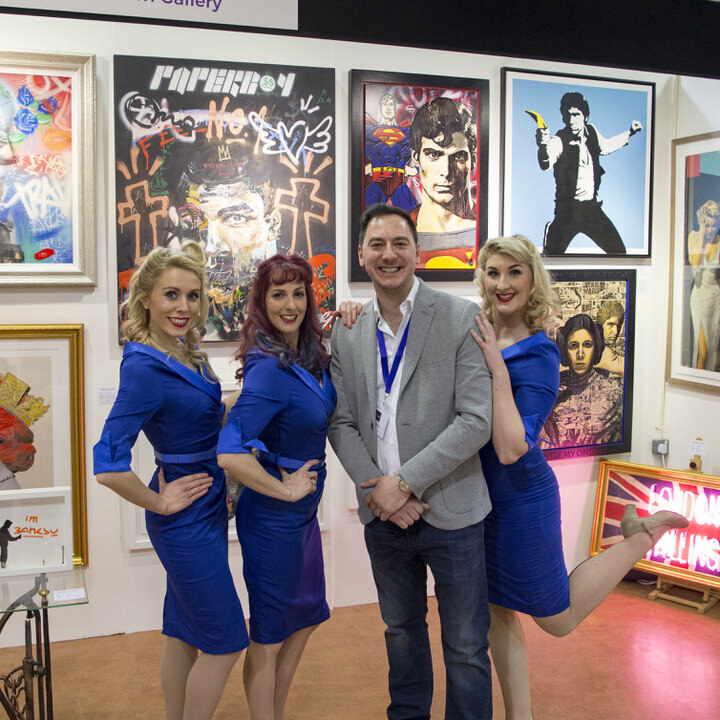 Our next fair appearance is at the Reading Contemporary Art Fair from April 20th to 22nd. Further details can be found here. 'Bacchus at the Seaside' by Banksy. Vandalised oil painting in artist's frame. Photography courtesy of Sotheby's. March was all about the incredible auction results from New York to London that strengthened the Banksy market and urban art genre particularly. With an estimate of $40,000 to $60,000 the 'Smiling Copper' by Banksy sold for an incredible $187,500 at Sotheby's New York. 'Smiling Copper' by Banksy. Spray paint and acrylic on shaped cardboard. However, the best was yet to come as 'Bacchus at the Seaside' (est. £250,000 to £300,000) sold for a healthy £669,000 at Sotheby's London! The Bansky print market also had many successes to take note of, with several prints selling well above their estimates. Catching up with Blek le Rat at the Urban Art Fair in Paris. 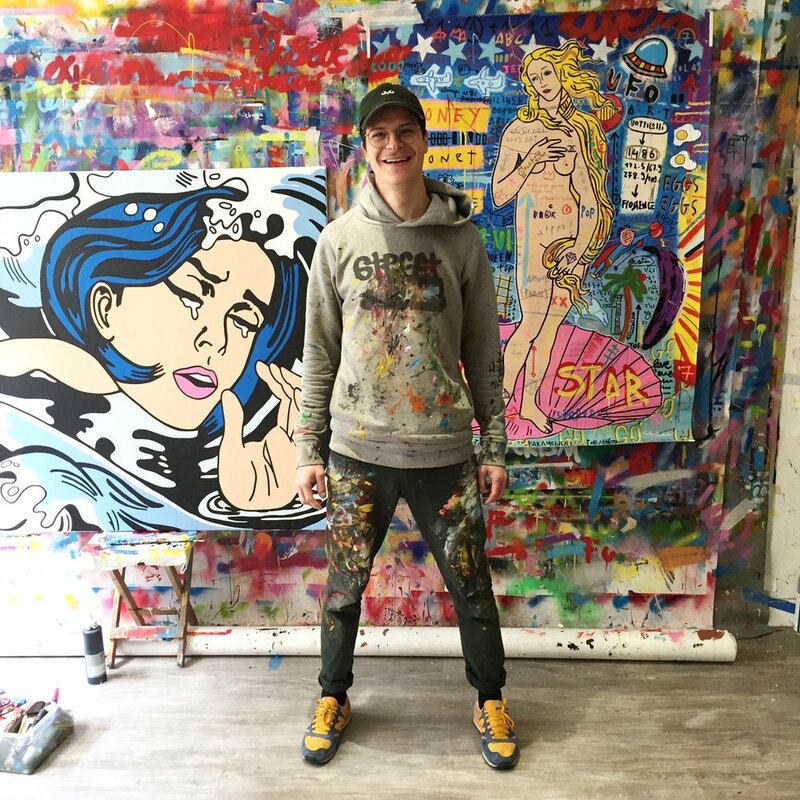 This April we popped over to Paris to check out the 3rd edition of the Urban Art Fair - the world's only street and urban art specific event which also debuted at New York in 2017. At the Thursday evening private view the fair was bursting at the seams with vibrant energy as a packed exhibition space embraced and absorbed the art on offer from a host of international galleries. Artists on display included US graffiti legends RISK and SEEN as well as one of our all time personal favourite artists Shepard Fairey. Rare artworks from KAWS and Banksy got the pulses racing. French masters C215, Space Invader and the iconic Blek le Rat led the Parisian charge in showing the world the sheer strength in depth of the urban art movement alongside the new emerging generation including our very own Thirsty Bstrd and a wealth of many other incredible artists. The future is certainly full of promise and potential for this exciting style and method of art creation. Sneek peak into the Jisbar's studio as he prepares for his upcoming solo show. 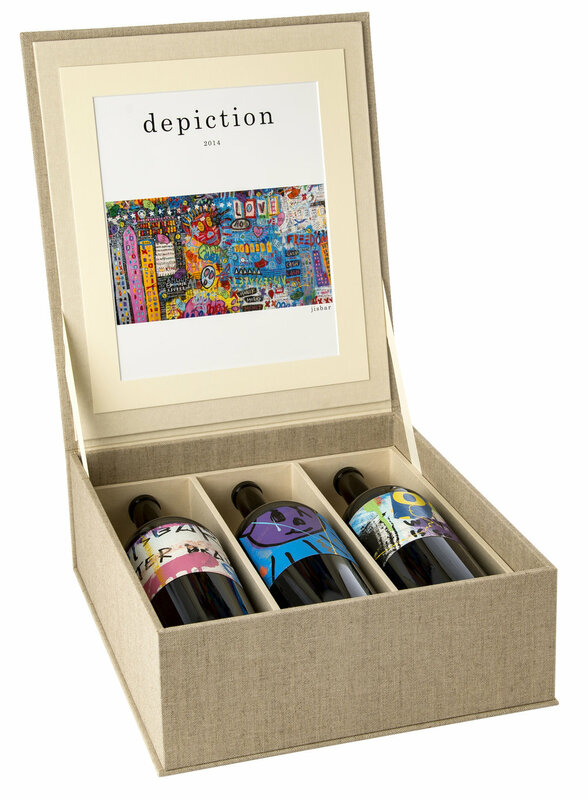 The Depiction Wines 2014 vintage is available as a box set of 3 magnum bottles. At just 28 years of age, Jean-Baptiste aka Jisbar is fast becoming an artist to take note of. Since moving to Paris 8 years ago to pursue his passion of becoming a professional artist, he has since exhibited across the globe from Australia to USA, including the Museum of Manarat Al Saadiyat in Abu Dhabi and the Museum of Modern Art in Malmo. One of his most recent projects involved collaborating with Napa Valley winery Depiction Wines, creating a large painting (115 cm x 300 cm) titled "Rhapsodie" that was then subsequently cut into bottle labels for their latest magnum vintage release. Later this April, Jisbar will fly out to San Francisco for a major solo exhibition that will display approximately 30 artworks. Our passion for Jisbar's artwork started on one rainy evening in Venice during the Biennale '17 and it's safe to say we have been enthralled by the authentic, infectiously fun style and message he portrays in his artwork since then. We are proud to be Jisbar's sole UK representative and privileged to have placed his paintings in some astonishing private collections as well as introducing new art buyers and seasoned collectors to this unique artist. For those not yet aware of this rising star, now really is an exciting time to join this young creative's journey. View the current collection available now here or contact us here for bespoke commission requests. Preston Paperboy surveys his latest exhibition at Boxpark, on until April 30th. It's been a busy and productive 2018 for emerging British artist Preston Paperboy (Nathan Preston), with a move to a larger studio and launch of his luxury leather goods and fashion brand Paperbóy Worldwide. He has since had solo art exhibitions at Boxpark Croydon in March and Boxpark Shoreditch which runs throughout April. You can read the full interview by Boxpark with Preston here. A selection of original paintings are available at Reem Gallery and online here. With a new body of work in development by Preston and further projects on the horizon, we're all very excited to see what the rest of the year has in store. Contact the gallery for further details on available artworks and commission requests. If you're local to the Hampshire area, more specifically Basingstoke, you most likely would have seen a number of colourful art installations throughout the town over the past few months resembling "book benches". These creations formed part of the Sitting with Jane art trail which commemorated 200 years since Jane Austin's passing. The project also celebrated the historical heritage of one of Britain's most influential women, an author who spent most of her life in Basingstoke and her final years in Winchester. The wonderfully talented Sian Storey was approached to create two of the 24 book benches on the trail; The Golden Peacock which took inspiration from Pride and Prejudice, and Once Upon a Time in Steventon which depicted Jane's birthplace. On Saturday 16th September the artworks were all auctioned off for the Ark Cancer Centre Charity, with the Golden Peacock raising a fantastic sum of £7,000 for a great cause. The centre is currently aiming to raise £5 million and has at the time of writing reached over £1.5 million. For further details and donations please visit Ark Cancer Centre Charity. View Reem Gallery's global portfolio of artists. Join us throughout the year for VIP previews and artist appearences. Contact the gallery for further information. © 2014-19 Reem Fine Art Limited. All rights reserved.